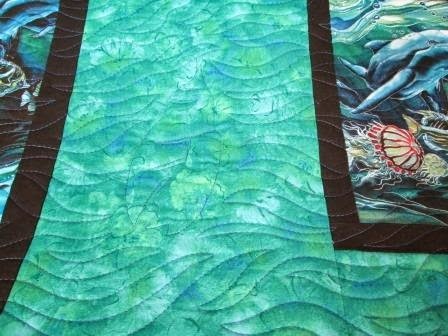 This past month I have had a few very large and wonderful quilts to do. This is one of them. My customer had bought this yardage and hated to cut it up so made it the center panel and then used blocks around the outside. It was a great way to show off the sea print. 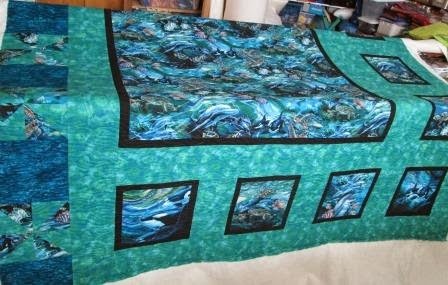 I quilted most of the quilt with sea weed looking lines but then in some of the teal fabric I hide sea animals and shells. Can you see the sea horse. This shot has a shell in it. She said it was like Where is Waldo. My husband also spotted it and told me he really liked it. He never comments on the quilts I work on. 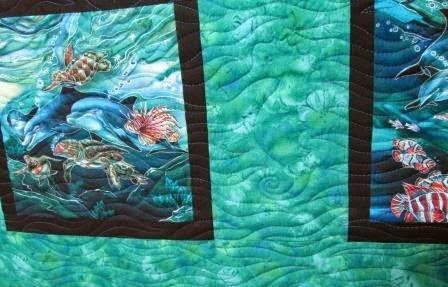 Your quilting design is so very cool! I'll comment - I like it. I love the hidden treasures you put into it. Nice quilt.